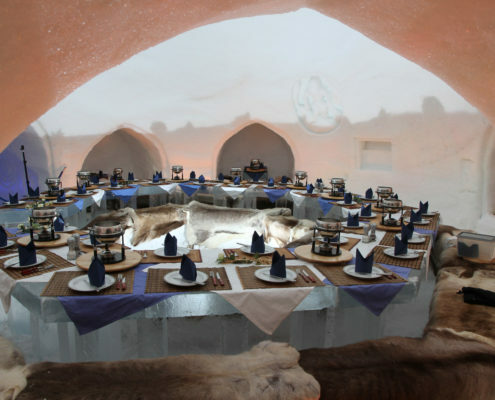 Enjoy a unique evening in the igloos – in a mystical world of ice and light! 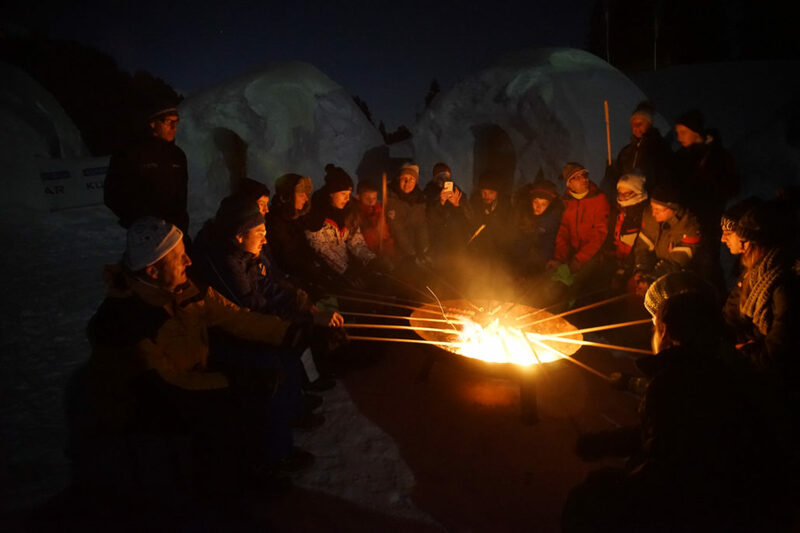 The igloo village appears in a totally different light at night: the huge igloos seem even bigger, the lighting more impressive, the ice sculptures more iridescent… and the wonderful silence in the Tyrolean mountains completes the fascinating experience. Treat yourself or make someone else a unique present. 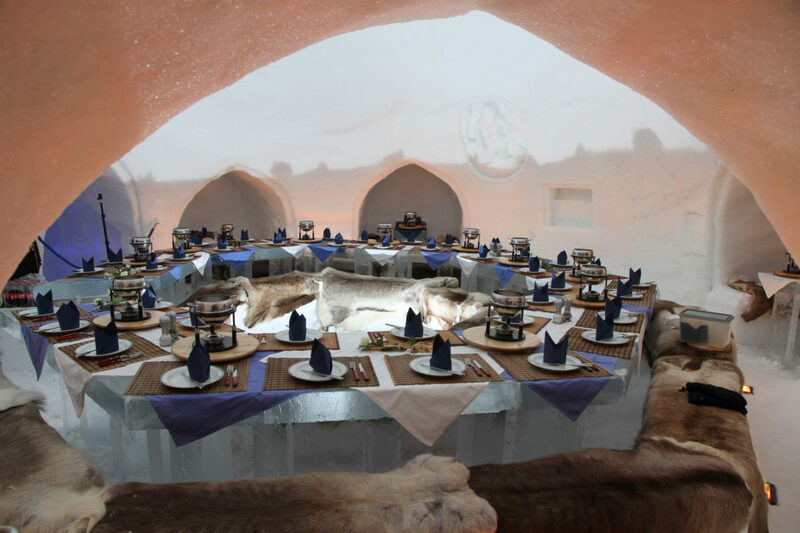 The special dinner Igloo Magic Evening is a romantic gift idea, which can be made even more special with a private candle light dinner. The outstanding evening programme starts in the late afternoon: from Brixen im Thale take one of the last gondolas up to Hochbrixen. The ALPENIGLU® village is only 150m away from the mountain station. 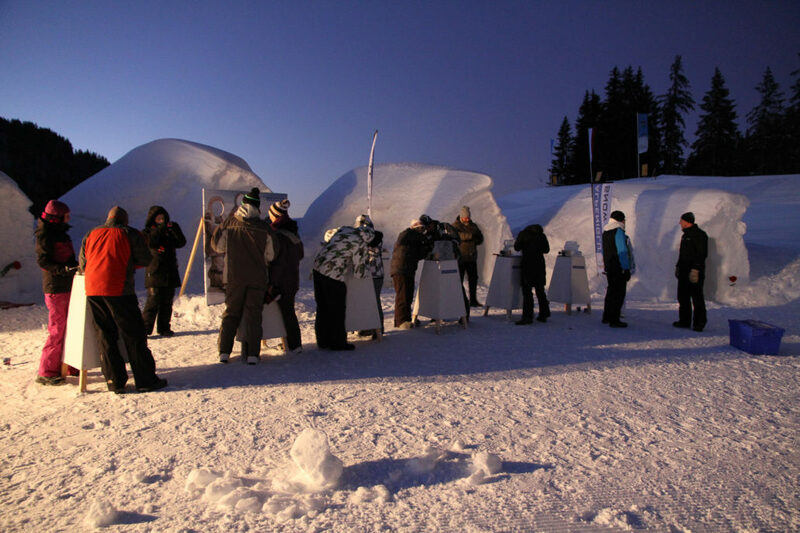 Our igloo guide welcomes you with a mulled wine at the ALPENIGLU® ice bar, the entrance to the village. 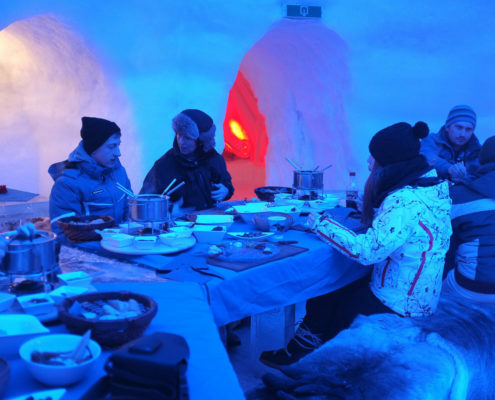 Next you get an exclusive guided tour through the ice sculpture exhibition ICE LAND as well as the whole igloo village which seams mystical and strange in the dark. Then you carve your own ice sculpture under the supervision of your professional guide. 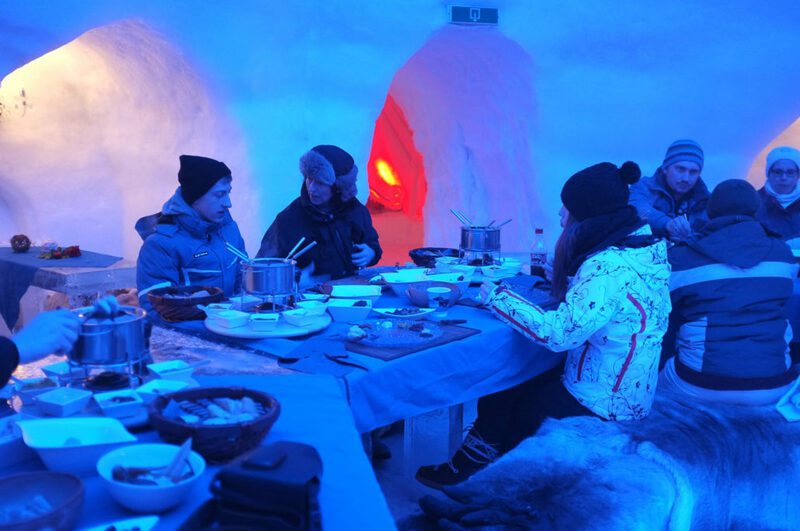 After that it’s time for the highlight of the night: the fondue dinner in the ice restaurant. Did you ever have dinner served at a table made out of crystal clear ice. After this great experience your guide will take you on a torch hike under the stars – in the middle of the snow white winter forest. Enjoy a beautiful winter night in the Kitzbuehel alps. After a bonfire we continue to a nearby mountain hut, where your taxi is already waiting to bring you back down to the valley. 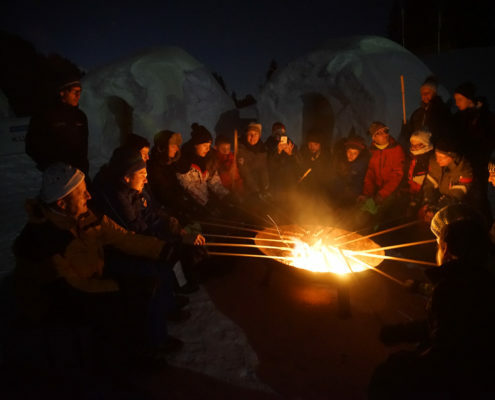 welcome by our trained igloo guides at the ice bar, welcome drink, ice carving workshop, dinner (meat fondue) at the ice table, guided tour around ICE LAND and the igloo village, torch walk, group taxi transfer back to the cable car station Brixen. The special experience for two: enjoy your dinner at a “table for two” especially decorated just for you. You start with a prosecco and complete your romantic dinner with a nice bottle of wine. (prosecco and wine included). Are you getting an igloo experience voucher for someones birthday? How about an additional “Birthday Special” – you book it and we make someones birthday extra special: igloo cake, prosecco, table fireworks and birthday decoration in the igloo for a perfect “big day”. Surprise your partner with an ice cold bottle of Champagne. The (0,375 l) bottle and glasses are already waiting for you when you check into your igloo suite. Cheers! Have an unforgettable igloo night. Before your igloo adventure starts you can explore the winterforest during a snowshoe treasure hunt in the afternoon. 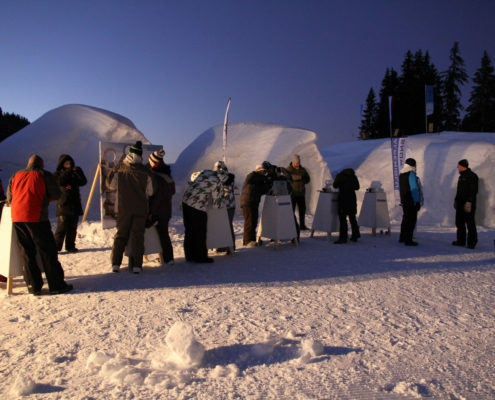 In the ice bar igloo you will get your treasure map, your snowshoes and walking sticks and a short briefing. After that it is time to start your excursion of the snowy winter wonderland on your own. On your way you will get the chance to stop for a nice coffee and cake in a cosy mountain hut (not included). If you follow the right track and find the treasure you will get a special reward back in the ALPENIGLU® village: a cocktail in a real ice glass.